Over three consecutive days, October 4 to 6, Nepalese climbers Nima Tenji Sherpa, Tashi Sherpa and Dawa Gyalje Sherpa ascended three unclimbed peaks—Raungsiyar (6224m), Langdak (6220m), and Thakar-Go East (6152m)—in the Rolwaling Himal in northeastern Nepal. This probably marks the first time that an all-Sherpa team has completed first ascents of unclimbed peaks in their home country, according to Himalayan record-keeper Elizabeth Hawley. The Rolwaling region contains many unclimbed peaks and is popular with trekkers. In 2014 the Nepalese government opened 104 peaks to climbing, including many in the Rolwaling Himal. Their intention was to increase revenue from tourists and climbers by selling climbing permits. In the past year, the range has attracted many small teams who did first ascents of unclimbed peaks as well as new routes on others. The three Sherpa climbers left Rolwaling Valley and spent two-and-a-half days crossing the Trakarding and Drolambau glaciers to a high base camp. On October 4, the trio pushed up the west ridge of Raungsiyar, reaching the summit at 3:15 p.m. and returned to camp three hours later. The following day they climbed to the west summit of Langdak before following the corniced West Ridge to the main summit. Nima Tenji reported on their expedition blog that Langdak offered the best view of any mountain he had climbed, with six of the world's fourteen 8000-meter peaks visible. On October 6, the Sherpa climbers made their final first ascent, climbing Thakar-Go East, a lower subsidiary summit of Thakar-Go (6793m). They climbed directly up the Northeast Ridge, passing sharp pinnacles at the start then following a long snow ridge. Dawa Gyalje reported to Alpinist: "We celebrated our team success with a big hug, and yelling on the summit." Dawa Gyalje said: "We are hoping as young climbers, to take climbing in Nepal to a new level. All of us have climbed much bigger mountains but always with foreign climbers. We want to show that we are not just porters on the mountain, climbing only for our livelihood, but we are interested in climbing because we enjoy it, too." He said that they can climb safely, are good leaders, can manage their own logistics, and hope that Sherpa climbers will receive sponsorships. "We are the young generation of Sherpa climbers but we are looking to the future of Nepal and Sherpas also." Janice Sacherer, an anthropologist and climber, said: "These recent achievements symbolize a whole new stage of Himalayan mountaineering." The three Sherpa climbers are all certified mountain guides from the Rolwaling valley. These climbers "are prepared to take Nepalese mountaineering to the next level.... They are young, informed, and have learned enough safety techniques to enjoy climbing for its own sake. They are also ambitious and out to make a name for themselves and their home community of Rolwaling by climbing alpine style." A week after the triple ascents, Mingma Gyalje received a climbing permit to make a solo ascent of a new route on Mt. Chobuje (6685m) above the Rolwaling Valley. The mountain was special to him since it rose above his childhood home. Mingma wrote on his blog: "I grew up seeing the mountain each day." On October 27 he climbed with three other Sherpas to a base camp below the icy West Face. After leaving camp at 4 a.m., he scrambled up rock bands and then started up steep snow and ice slopes. The climbing was difficult and unrelenting, with no resting places. He called it "the hardest mountain I ever climbed." After thirteen hours of climbing, he reached the summit ridge and followed it to the top. He descended the easier back side in a whiteout, getting lost in the snowstorm and spending two nights bivouacked in snow holes before being rescued by a helicopter, which brought him down to his village where his mother, sister, and friends waited. Mingma said, "Once we landed at the door, [everyone] came to me crying which I felt [bad about] because it was my fault for going solo on such a difficult mountain." Besides the Sherpa climber ascents, Americans Ryan Waters and Eric Larsen visited the area in September. The pair aimed to explore unclimbed peaks above the Drolambau Glacier next to 5755-meter Tashi Lapsa pass, including Jabou Ri (6166m) and Thakar-Go East (6152m). The team trekked into the Rolwaling Valley in late August, arriving in the village of Na on September 3. They continued up the valley until they were below the peaks. Here their porters left and the climbers shuttled loads onto Drolambau Glacier. 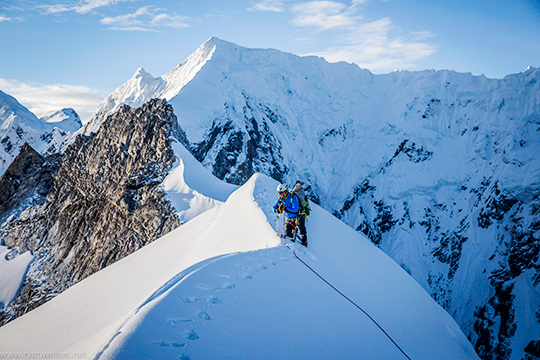 After a bad weather spell, they established a camp southeast of the peaks on September 10 and focused on climbing the elegant south ridge of Jabou Ri. With a weather break, they kicked steps up snow slopes to the ridge, then returned to their high camp to prepare for a summit attempt. Early the next morning they left camp and reached the ridge at first light. Waters and Larsen climbed the east-facing side of the ridge to a steep section where they encountered firm ice and snow. They regained the ridge and continued climbing for several hours on terrain up to 60 degrees before stopping before a narrow section. Waters sat on the knife-edge ridge, belaying with one leg hanging over either side of the ridge and watched clouds envelope them. The climbing ahead looked difficult, with cornices and steep drop-offs, and would be difficult to reverse in bad weather so they chose to retreat here. Back at base camp, the climbers mulled over their next plan before the porters returned in a few days. No time remained to scout Thakar-Go East, their other objective, for possible lines, but Waters and Larsen found they could reach a glacier below the northeast flank of Jabou Ri and attempt an easier route to its summit. They left camp at midnight, navigating through large boulders in a moraine to the glacier where they found a straight-forward route to the virgin summit. Most of the climbing was on moderate snow with a few short, steep sections up to 55 degrees. 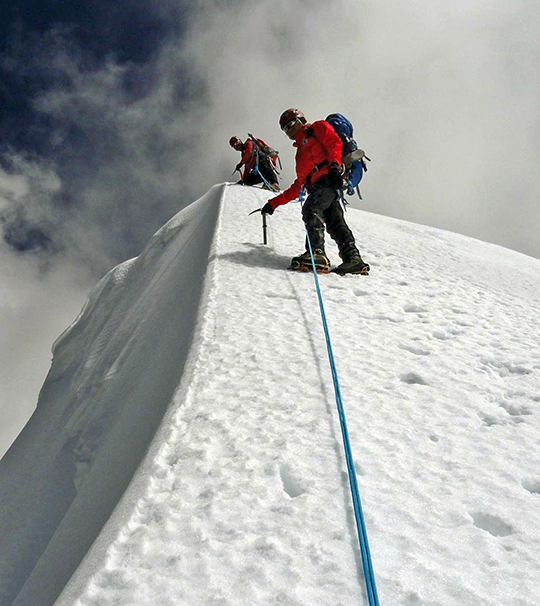 The climbers reached the summit on September 16 under clear skies. Waters said that many new routes await climbers on Jabou Ri, including direct ice lines up the east face. Thakar-Go East offers some "really impressive climbing lines on both the south side, steep mixed rock and ice routes, and the north side, which can be accessed by a glacier to a steep jagged ridge line," Waters said. The three Sherpa climbers made the first ascent of Thakar-Go East, a lower subsidiary summit of Thakar-Go (6793m), the following week. Read more about the Rolwaling region in our NewsWires from November 8, 2013, December 5 and December 18, 2014. Very very great job - WELL DONE Boys.